The Clifton Opera House is proud to present some of the best bluegrass in Ohio. On Saturday, April 6th, Black Diamond returns to Clifton. Black Diamond is an accomplished Ohio based bluegrass band, featuring one of a kind, tight vocal harmony. Coupled with great picking and enthusiastic personalities, this band is a hit! Formed in 1997 the band started out performing for private parties and events all over Ohio. 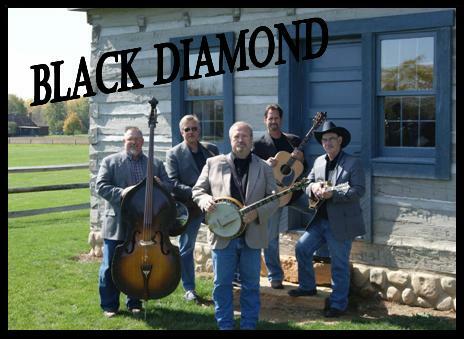 Black Diamond has many influences dating back to the founder of our music (Bill Monroe), original music written by members of the band, to the newest artists on the circuit today. Black Diamond is a real joy to watch perform. The Clifton Opera House is located at 5 So Clay Street, Clifton. Door donation $7.00. Box office opens at 6:30, show starts at 7:30pm. Call 937-767-2343 for more information.